« Read Health Care Websites With A Critical Eye! The holiday season is a joyful time for many people, but also a time that brings an enormous amount of stress for some, especially those with depression. Stress is an emotionally and physically disturbing condition you may have in response to certain life events. In this case it includes the change in daily routine and overload of responsibilities that are common during the holidays. Holiday stress begins with a “should” list that is bound to get anyone into trouble. I “should” do this or go to that function or get that gift. I “should” prepare a holiday feast for my family or make a gift like Martha Stewart! Beware of the word “should.” We all have a desire to please others by making the holidays picture-card perfect, but that is not reality. You may tend to take on an overload of responsibilities and then feel guilty if you cannot live up to that self-imposed standard. Or when depressed, you may not feel like doing any of it and feel guilty later for ignoring your loved ones. When your mood and energy levels are down, it is often difficult to muster the effort to participate in the activities of the season, especially since you may have no interest in doing so. That’s part of the illness. But at the same time you may feel pressure to participate, either from within or from family members. Pressure to put on a cheery disposition around others. Pressure to prepare an elaborate holiday meal for your family. Pressure to attend the many holiday functions at work/school or with friends or family members. Do what you can realistically do this year. Take a step back and learn to say “no” if necessary during this time so as not to overcommit yourself. Expectations are tricky. At the holiday time they often appear as an artificial set of standards that you impose upon yourself, based upon some unreachable ideal in a magazine, on television or what your great-grandmother was said to have done. Trying to reach these unrealistic expectations will only bring you disappointment and more stress, not pleasure. Instead, think about where you are with your depression, and what you can realistically do now for yourself and your family. Set out small goals for your holiday season, ones that are attainable. Break each one down into small steps. Keep it all very simple and you and others will enjoy it more. Another source of stress is an upset in one’s daily routine that happens by attending holiday-related social functions, shopping in crowded malls or making holiday-related meals and gifts for loved ones. This can take up quite a bit of time and be more unsettling than you realize. When you are suffering from depression or bipolar depression, dealing with such daily changes can be much more difficult. It’s thought that small changes in one’s daily routine challenges the body’s ability to maintain stability, and that those with mood disorders have more difficult time adapting to these changes in routine. A third source of stress is getting together with distant family members or old friends with whom you may have very little in common any more. You may feel it as an obligation and not a joy of the season, and may dread the anticipated unpleasant interaction but do it for the sake of “family.” When depressed, you may choose instead to politely bow out of these functions. If that isn’t possible, try to limit your time with them. 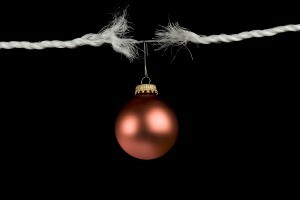 So, when holiday stress arrives anyway – now what do you do? There are ways that you can manage it and lessen the effect of the stressful events. These are called coping techniques. First, try to limit your exposure to any one stressful activity, event or person(s). Maintain a regular schedule of daily activities, including diet/nutrition, sleep, exercise, and self-care. Enjoy the holiday food but don’t over-eat or drink and be sorry later. Try to prioritize your responsibilities and activities and don’t overschedule, if possible. Break down large tasks into smaller steps. Keep a calendar and make lists of what you have to do. Use problem solving strategies. Take care of yourself and try relaxation and self-soothing techniques regularly. Use humor to distract your mind – a funny book or movie often works wonders at these times. Try mindfulness meditation to stay focused on the moment. All of these are explained in my book Managing Your Depression: What you can do to feel better. This entry was posted in Living with Depression, My Thoughts, Stressors. Bookmark the permalink. Post a comment or leave a trackback: Trackback URL.